Mix egg and water. Mix bread crumbs and Parmesan cheese. Dip veal into egg mixture, then coat with bread crumb mixture. Heat oil in 12-inch skillet over medium heat. Cook half of the veal at a time in oil about 5 minutes, turning once, until light brown; drain. Repeat with remaining veal, adding 1 or 2 tablespoons oil if necessary. Place half of the veal in ungreased rectangular baking dish, 11x7x1 1/2 inches, overlapping slices slightly. Spoon half of the pasta sauce over veal. Sprinkle with 1 cup of the mozzarella cheese. Repeat with remaining veal, sauce and cheese. Bake uncovered about 25 minutes or until sauce is bubbly and cheese is light brown. When you have more time than money, buy veal round steak instead of the pricier veal for scallopini. Cut steak into 12 pieces, then flatten the pieces between sheets of plastic wrap or waxed paper with a meat mallet to 1/4-inch thickness. No meat mallet? Try using a small cast-iron skillet. 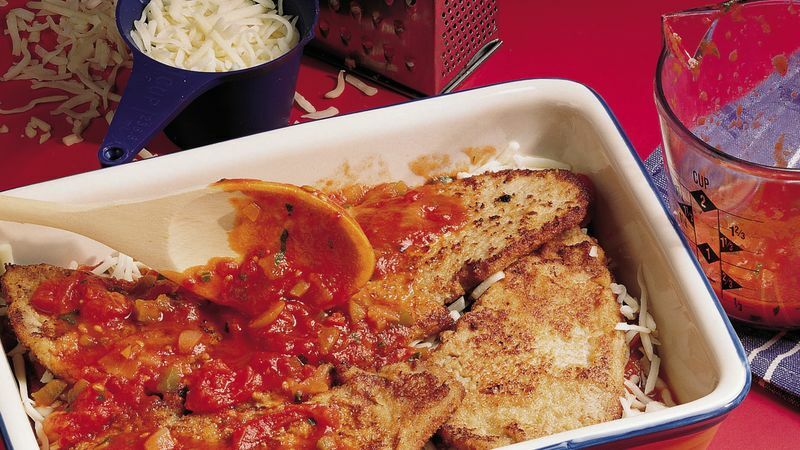 For Chicken Parmigiana, just use 8 boneless skinless chicken breast halves (about 2 pounds) for the veal. Flatten chicken between sheets of plastic wrap or waxed paper to 1/4-inch thickness. For Eggplant Parmigiana, use 2 small unpeeled eggplants (about 1 pound each). Cut each eggplant into 1/4-inch slices.